Seventeen-year-old Jane Peterson of Minot has been named 2015 Miss Norsk Høstfest. That means you’ll find her at the festival each day, meeting people and connecting with her Norwegian heritage. Peterson is the daughter of Jeff and Diana Peterson, and is a senior at Minot High School where she’s an active member of FBLA, FCCLA, and National Honor Society. Having admired Miss Norsk Høstfest’s of previous years, she says that she’s excited to wear the crown herself. While the Miss Norsk Høstfest title may be new to Peterson, Norsk Høstfest is not. In the 6th grade, she was a participant at Scandinavian Youth Camp, a camp held the weekend prior to Høstfest for children in grades 2 to 10. 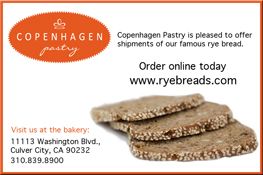 From there, Peterson grew to be active in the festival itself, enjoying many of Norsk Høstfest’s offerings. 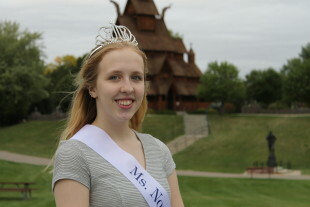 While being Miss Norsk Høstfest, Peterson hopes to gain a little more insight into her Norwegian heritage and make life-long connections with the Scandinavian community. One of her first tasks will be heading to the Import Shop to pick out her new Norwegian Sweater, compliments of Dale of Norway. She also will be attending the festival the entire week, greeting guests and attending important events such as the Governor’s Reception and the Scandinavian-American Hall of Fame Banquet. When talking to Peterson, it is easy to see that she is no ordinary teenager. Having been diagnosed with bone cancer in November 2014, she battled the disease and is now cancer-free. But not without a few casualties. Even now, her prosthetic leg doesn’t slow her down. She may get a curious glance from a passerby, but she doesn’t let it bother her one bit. But while cancer may have been a hindrance, it also yielded some surprising results. In fact, thanks to North Dakota Make-A-Wish, Peterson was able to fulfill her dream of learning to be a bee keeper. The teenager now bottles her own honey – Buzz Off Honey – and sells it at the family vineyard, Point-Of-View Winery. She says she has future plans of selling it at local flea markets and craft shows, along with attending college to become a nurse practitioner.